← “Recycle Man” To The Rescue! 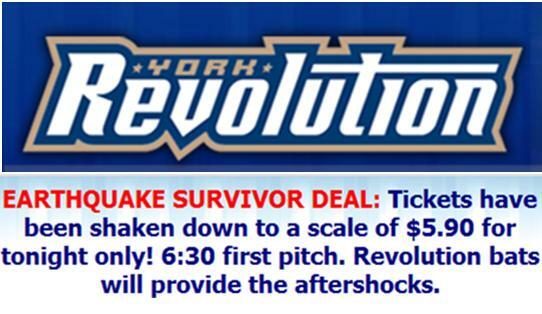 I swear the York Revolution Baseball promotions department are Lobsters. They must read LobShots. How else could they have planned this? I write a post about how awesome Minor League Baseball is…again…and moments later there’s this earthquake that has the East Coast crying Armageddon. Moments after that? Blammo…the York Revolution throws up a promo for the ages. An “earthquake survivor” deal. Brilliant. Why $5.90 for the tickets, you ask? Oh, I dunno, maybe because the quake was a 5.9 on the Richter scale. (yes, I think it’s been revised to 5.8, so what. And yes, I know they aren’t technically Minor League Baseball because they have no MLB affiliation, they’re in the Atlantic League of Professional Baseball) Either way, if I lived in Pennsyvania, I’d be at this game in a hot second. Just awesome. Good luck tonight, boys. This entry was posted in Baseball, News and tagged Atlantic League of Professional Baseball, Baseball, earthquake, virginia earthquake, York Revolution. Bookmark the permalink.